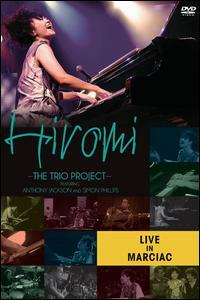 On her 2011 album, Voice, Hiromi sought to capture people’s “inner voices” and strove to create what she called a “three-dimensional sound.” For that album, the Japanese composer/pianist assembled a trio that included herself and two veteran players – contra-bass guitarist Anthony Jackson (Paul Simon, The O’Jays, Steely Dan, Chick Corea) and drummer Simon Phillips (Toto, The Who, Judas Priest, David Gilmour, Jack Bruce). While Hiromi had played with Jackson prior to recording Voice, she had never recorded an entire album with either him or Phillips. “I had such a great time recording with them, and we went on the road together and that was even more fun,” she says. “As soon as we started playing live shows, we grew up as a band. It was the biggest fun I’ve ever had in my life musically. That’s why I wanted to do another record. I couldn’t let it go. I wanted to do it again.” Next April, Hiromi will bring her “Trio Project” to the SF Jazz Center, and next week, her new album is set to be released. The album comes to a close with “11:49 PM,” an 11-minute song designed to mark the end of one day and the beginning of a new one.